The ASCII Grid Reader adds native support (direct read) for ESRI ASCII Grids to ArcMap and ArcCatalog, automatically stretching between MIN and MAX values in the GRID. Spatial models which have been written outside of standard GIS applications (i.e. written in C/C++ or Fortran), often use the ASCII Grid format for storing intermediate and / or final results. ARIS has a solution (already since ArcGIS 8) which makes it possible to preview ASCII Grids directly and without conversion in ArcCatalog, and to use them in ArcMap. 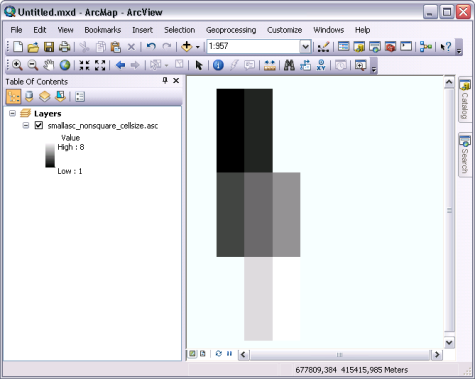 All the usual raster operations in ArcMap (for example the Spatial Analyst tools in ArcToolbox) can then be applied to the ASCII Grid. Floating-point and integer type ASCII Grids are recognized automatically. When an ArcGIS projection file (.prj) is placed next to the ASCII grid with the same name but different extension (e.g. 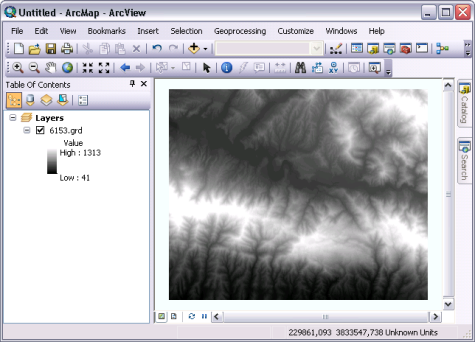 world.grd and world.prj), the projection information is passed automatically to ArcCatalog and ArcMap. ARIS ASCII Grid Reader calculates automatically MIN and MAX values (statistics) in order to display the grid in the applicable range (The default ESRI *.ASC reader in ArcGIS 9.3/9.3.1/10.0 does not calculate those values and shows an all grey or black GRID). A Floating License is introduced next to the existing Single Use license (Unrelated to your ArcGIS license form). Non-numeric Nodata value like "NULL", "NA", "mv", "! ", "-"
The Spatial Analyst extension or Data Interoperability extension is not required. Use the Contact Form to request new features or suggest modifications to existing tools. Please contact us if you have any other questions about the ARIS ASCII Grid Reader. Interested? You can download a fully functional, 5-day trial version for a specific ArcGIS version by clicking on the "Download setup" link or view the User's Manual in the table below. If you decide to purchase this product, a key will be sent to you by email. This key will enable you to unlock the permanent version. Note: The information in this page is updated to the latest version. See the appropriate manual for specific version capabilities. If you have many potential users (at least 4) using 1 license concurrently a Floating License may be appropriate. The Floating License version does not support trial mode. Please try the regular version first.